Are you tired of having to buy a new umbrella two or three times each year because the cheap models you pick up keep getting destroyed every time you’re in a bad storm. I know I was, but that was until I discovered what may very well be the greatest umbrella that has ever been created. 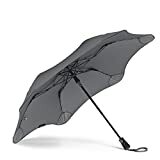 The BLUNT Metro Travel Umbrella has a unique design with a 37-inch rip-resistant canopy that can withstand sustained wind speeds of up to 55 mph. Trust me, that’s much faster than any wind you’re every going to encounter in a storm that isn’t a full-fledged hurricane. This awesome compact model is only 14-inches long when it’s folded closed, and it weighs 0.82 lbs so you won’t even know it’s in your bag. EXCLUSIVE BLUNT tips have no sharp points. Safe to use in congested locales without injuring others. WIND RESISTANT Radial Tensioning System defies heavy downpours and gale-force winds of up to 55 mph. 37” RIP RESISTANT polyester canopy creates a sturdy, aerodynamic defense against inclement weather. COMPACT 14” length when folded, and weighs 0.82 lbs. Easy to carry and store in its included sleeve. 30 DAY MONEY BACK GUARANTEE ensures your satisfaction, or we’ll refund 100% of your purchase price.